It's been one week and I'm falling more in love with my little guy everyday. He's so sweet and cute and he's a great sleeper. My kind neighbors heard the news about our baby and dropped off some delicious cupcakes from The Perfect Circle Cupcakery. I already knew I loved the Pumpkin, but the Chocolate Peppermint was new to me. Delicious! I'm slowly making my way back into the computer world. 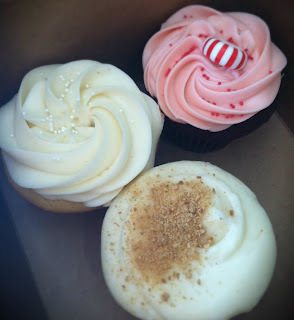 Can't wait to blog about my cupcake baby shower and my recent trip to My Delight Cupcakery. Hope everyone is enjoying this wonderful holiday season! so cute! Congrats I am so happy for you! he is precious.